If you read any online media magazine you have most likely stumbled on this new advertising paradigm coined “Behavioural Targeting”. It is being hailed as the “saviour of online advertising“, the holy-grail of marketing and so many other superlatives that you can’t stop asking yourself what the heck is the fuss all about. Depending who you ask Behavioural Targeting is you will get a different answer. You see, it’s such a buzzword that most technology providers are quickly getting on the bandwagon sometimes by just adding that extra bullet point on their sales presentation’s “what we do” list even though they’re not offering anything new. But not all Behavioural Targeting (BT) is created the same. Any form of targeting that uses a visitor’s current (session) or past (historical) activity can be considered Behavioural Targeting. So in a sense we could say Contextual targeting was a subset of behavioural as this is using the visitor’s current activity to determine what ads to deliver. This is usually not considered behavioural but it shows to what extent it’s possible to get confused. Search keywords: Individual search queries or in a aggregated search categories. Registration data: User-supplied data, such as Age, Gender and Income. Page keywords: Relevant content keywords present on the pages the user visited. With these inputs we can create segments at all the various shades of BT, with Contextual being at one extreme and Psychographic at the other. How this data is captured also differs from company to company. There are two main methodologies, the first being with the collaboration of the web site publisher, who willingly participates by tagging the site with html code. Wunderloop, Audience Science and Tacoda use this method. The second is using the now infamous “Deep packets inspection” technology, which involves reading and changing the browsers requests at the ISP-network level. Phorm, NebuAd and Front-Porch are examples of such DPI technologies. Interest-based targeting: Targets users based on the topics of the pages they visited previously. May allow selecting “frequency” and “recency”, i.e. visited “car pages” more than 3 times in the past 28 days. Profile clusters: Advertiser target: Uses data-mining to find the best targeting criteria using the available user data. This is the first time where a target definition is based on statistical data as opposed to advertisers guesstimates. It may completely differ from the campaign message, e.g. “visited cars more than 4 and less then 10 times and has not been to a sports page” could be the best target criteria found for a particular campaign advertising “Family holidays”. 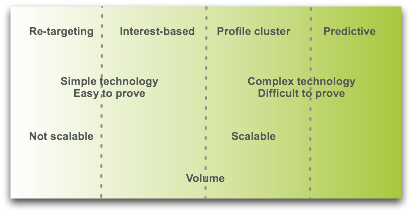 Predictive targeting: Socio-demographic: Predictive and Profile clusters are fairly similar. Predictive socio-demo also uses data-mining but this time to extrapolate a target criteria that best addresses a particular gender and / or age group, in some advanced instances the predictive model itself can change dynamically depending on the data inputs. Predictive targeting: Psychographics: The holy-grail. Predictive psychograpics takes the data-mining one step further and attempts to find the best criteria to match a particular marketing segment audience that share the same “personality, values, attitudes, interests, or lifestyles”. This is akin to what advertisers have been used to target their advertising with in the offline world with tools created by companies such as Claritas and Acxiom. As the saying goes if you can’t bring Mohammad to the mountain bring the mountain to Mohammad so this type of targeting is becoming the ultimate goal to win the trust and money of FMCG advertising in the online world. Common target groups include 80s social stereotype descriptions like “Young Urban Professionals“, “Double Income No Kids Yet” or more recent ones such as “LOHAS” or “LOVOS“. The first level of BT is taking user’s activity beyond the results page. This is typically coined “Re-targeting” and is frequently used with top paid search terms and with specific publishers “conversion” pages such hitting half-way through a shopping order. Companies such as RightMedia, DoubleClick or Adconion provide the technology for this type of targeting but most importantly they also provide the platform to buy the targeted inventory from their network of publishers. Whilst re-targeting has very useful applications and it does perform quite well it has it’s limitations, mostly reach and scalability. Imagine you have 30 separate re-targeting pixels, one for each of the pages you want to track, it can start to become very messy to organise and book your campaigns based on this data. Not to mention forecasting. Solution? Put all these data collection pixels together into “buckets” and give them a name based on the topic of the page you are tracking. Get all your car-related pixels into the bucket “Cars” and all your entertainment pixels into “Entertainment”. What this means, really, is that you can add new pixels to your data collection without having to worry about changing the targeting of your existing, and future, campaigns because the campaigns are just targeted to the “bucket”. This is what I call “smart re-targeting”, but the industry likes to call it “Interest-based targeting”. This is, for example, what Google launched this week. This entry was posted on Sunday, March 15th, 2009 at 6:40 pm	and is filed under advertising. You can follow any responses to this entry through the RSS 2.0 feed. You can leave a response, or trackback from your own site. Really enjoyed this post – great explanation about where retargeting falls in the BT arena, as well as what exactly it is and how best to manage it. While this is true for most advertisers and agencies that choose to implement retargeting campaigns on their own; however not true if you work with a retargeting provider, like FetchBack, that uses one Smart Pixel for an entire site, and gives greater results due to easy optimization. It’s definitely worth the time to investigate – especially as most advertisers are able to see an ROI of up to 15:1.